← What is API and what VeryPDF cloud based API can do for you? Is there an API for converting PDF to Image and image to PDF? Question: Hi, I need a programming Tool/API giving me the ability to perform on the fly PDF to image conversion within a web-based environment (Server-side) Also, IMAGE to PDF. Is there such API on VeryPDF? Answer: When you need to API with the ability to perform on the fly PDF to image and image to PDF, maybe you can have a free trial of those VeryPDF cloud based applications: PDF to Image Converter Cloud API and Image to PDF Converter Cloud API. By those two API, you can use it under server based environment. When you need to use those two API, you just need to buy one API code. Normally speaking, when you use desktop version software, you need to buy two software. However, for using VeryPDF cloud based applications, all you need to pay once for one API code less than 20$. 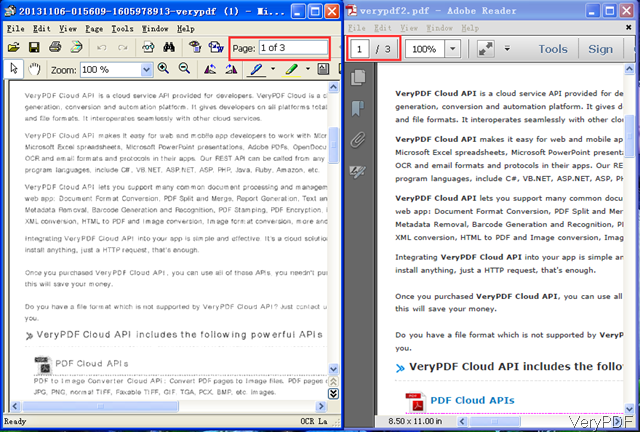 Then you can use them freely also together with other API application on VeryPDF. Please check more information of those API on homepage, in the following part, I will show you how to run those two conversion. When you use VeryPDF cloud based API application, you do not need to download any application and take computer system into consideration as there is no limitation. When converting image to PDF, simply open any browser and input URL following the below example then you can run the conversion. By this above URL, we can convert image of PNG to PDF. When converting image to PDF first you need to upload the image to online image file, as now this API can not be used to convert local file to PDF. For changing local file to online file, you can use VeryPDF cloud based other application like VeryPDF ShareFile or http://a.vpdf.net. Please get an API code if you feel this one is good for you as by the trial version there will be watermark on output. For getting API code, please register an account then pay for it. By this method, you can also convert other image file like JPG, PNG, TIFF, BMP, GIF, TGA, PCX to PDF. Simply change the file format extension. For converting PDF to image. By this above URL, we can convert PDF to multi page mono tiff image file. As to the rule of URL, it is same with the first one. Now let us check the conversion effect from the following snapshot. How to create PDF from Android? How to open PDF file without an installed application on device? How to make a PDF viewer in flash? This entry was posted in VeryPDF Cloud API and tagged image to PDF, PDF to image. Bookmark the permalink.